A new Mercedes-Benz Sprinter is big news in the van world. 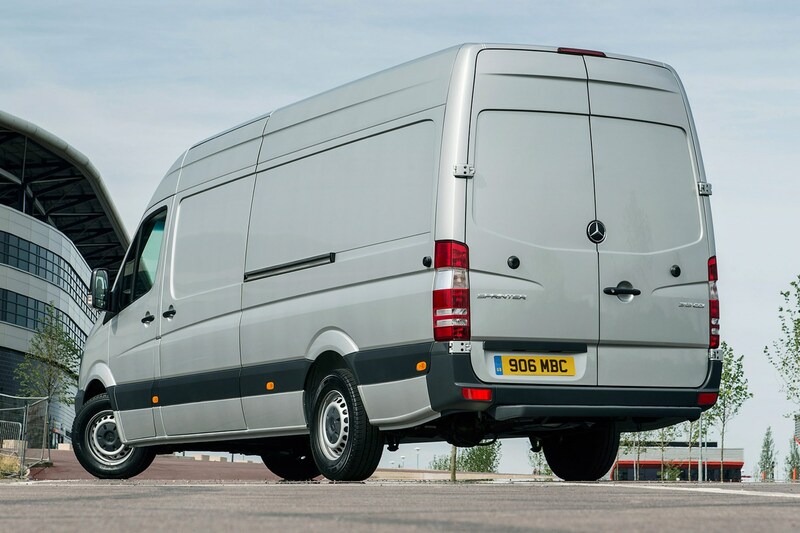 The highly popular large van is a common sight on the UK's roads and the German marque has sold nearly a quarter of a million Sprinters of one guise or another in Britain alone since its introduction in twenty-two years ago – that's more than 11,000 a year! 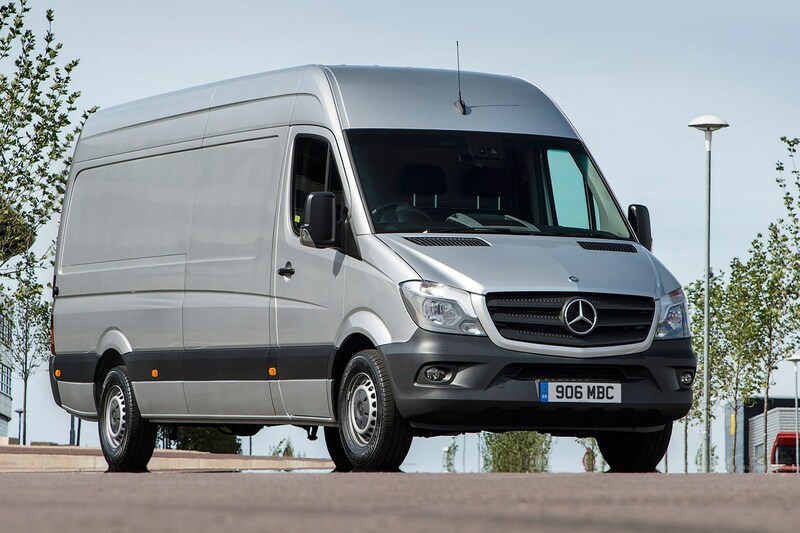 With the imminent arrival of the new, third-generation Sprinter, I took a closer look at the outgoing model (2013-2018). We have a limited stock on special offer available here at Concept Vehicle Leasing, but only while stocks last. Known as the Dodge Sprinter and Freightliner Sprinter in the US, the award-winning Mercedes-Benz Sprinters for the UK market are built in Düsseldorf, Germany. Despite its imminent replacement, this model of Sprinter achieved record sales in 2017 - which tells you much about how well-regarded this large van legend truly is. Up until 2017, you could also buy a Volkswagen Crafter that was essentially the same van at a slightly lower cost. Now, the all-new VW Crafter (introduced in 2017) is one of the Sprinter's greatest rivals. Similarly, the latest generation of the full-size Ford Transit introduced in 2014 is a comprehensively appealing all-rounder that complements its less premium image with a lower price tag. You may also want to pop the Fiat Ducato and the Iveco Daily in the mix of worthy Sprinter rivals. However, neither of the above are the best choice if maximum payload is your major concern. For that you'll need to consider one of the older large vans from Renault's Master range or Peugeot's Boxer line-up. 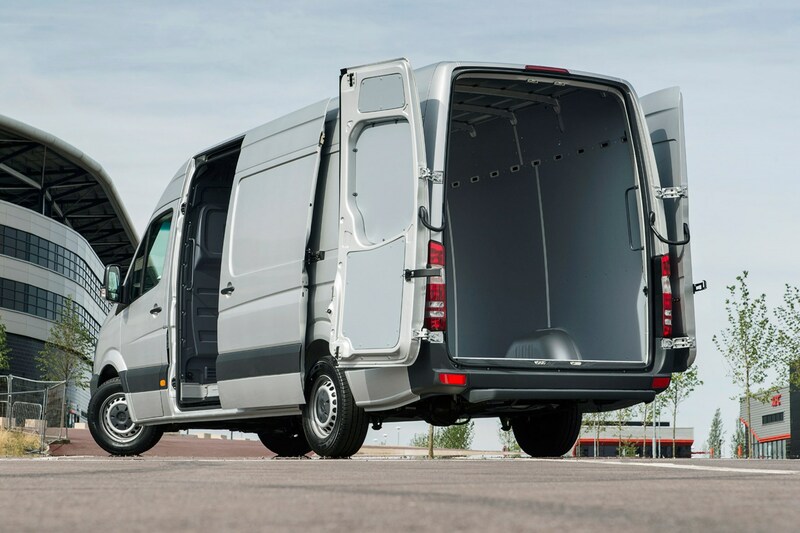 In 2013, the Sprinter underwent a series of major upgrades and moved the game much further on; it became safer, more efficient, wore sportier looks (if, indeed, a van could look 'sporty') and took on board more technology than any previous Sprinter variant. Safety is ingrained at Mercedes-Benz and the 2013 Sprinter benefited from a raft of systems that aim to keep both occupants and pedestrians out of trouble. For instance, 'crosswind assist' was introduced as standard, which detects when a gust of wind pummels into the side of the van and compensates for it, meaning you continue driving in the direction you intended. I spent much of last week driving the 314 CDi with six-speed manual gearbox, in medium wheelbase and high roof configuration. The first and probably most appealing thing you'll notice about the Sprinter is just how easy it is to get in it and drive. Climb up into the raised cabin and you find all the necessary controls fall easily to hand and foot – except perhaps the handbrake lever which is situated rather low down between the seats. It's easy to adjust the driver's seat to a comfortable setting and the dash-mounted gear lever is well set for easy inter-cog exchange. Inside, there's a good quality feel to both the switchgear and materials used. While there is a distinct utilitarian air about the cabin, it must be remembered that this is a working vehicle as, like an aircraft, it doesn't make money when stationary. Everything feels hard-wearing and well screwed-together – a work-a-day van without any unnecessary bells and whistles. The Sprinter's cab doesn't quite have same amount of storage for daily detritus as more recently-designed rivals, but there's room for three strapping adults with little compromise. There are dual overhead folder holders with large sun-visors, a clever little document clip below the media screen and dash-top storage with enough space for clipboards and devices. Rather irritating is the close relationship between the indicator stalk and the stalk for the standard-fit cruise control – it's easy to activate one when you meant to activate the other. The touchscreen infotainment system looks reasonable, but is quite old-tech now; navigation is only optional and DAB radio isn't available at all. In line with every other van maker, Mercedes brought in further engine updates in order to comply with Euro 6 emissions legislation. This resulted in engine revisions that added extra power, but at the expense of some payload capacity. The 314 CDi tested here replaced the preceding 313 CDi as the mid-level 2.1-litre four-cylinder turbodiesel option in the 3.5-tonne GVW (gross vehicle weight) Sprinter. To decode Mercedes' slightly erroneous naming process, the first digit refers to the gross vehicle weight rating – 3 standing for 3.5t – while the second pair of digits refer to the power output. This version of the Sprinter has 140hp, a useful 11hp increase over the outgoing model; even more usefully, torque also increases from 305Nm to 330Nm. Available from just 1,200rpm, the torque is plenty to get the medium-wheelbase, high-roof body variant moving, quite rapidly in fact with its light throw, unfussed manual six-speed gearbox. The Sprinter panel van is no lightweight in terms of quality of finish and build that Mercedes provides (which is impressive), but less so if you're looking for maximum payload weight. In this particular configuration, you're capped at 1,216kg – which is not too far removed from most latter-day pick-ups. So, it's best for bulky cargo, up to a certain weight. The new 18-litre AdBlue tank that's required to reduce emissions to Euro 6 levels doesn't help, but there are certainly lighter vans to choose from if the weight of your load is your main concern. In the cargo zone there are eight floor-mounted tie-down points and an additional two attachment points in the B-pillars. It has a lined floor, but no ceiling or wall lining, and there's just one halogen light at the rear of the cargo area. The rear doors open to 270 degrees as standard (on all but the short-wheelbase Sprinter), while the side door slides to leave a 1,733mm opening. The standard bulkhead is solid steel, but windows and even a door are available. Mercedes sells the Sprinter in three other wheelbases (short, long and extra-long), and offers a choice of three roof heights. 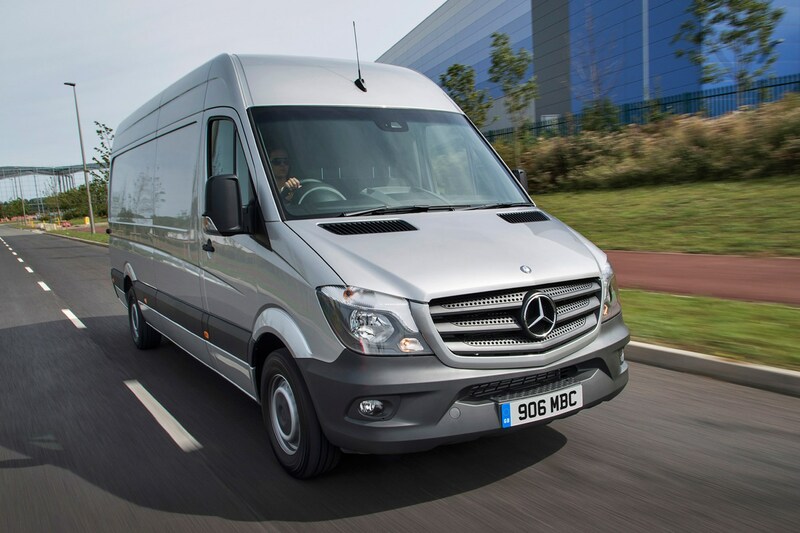 Considering its size, the Sprinter is remarkably easy to handle. The height of the driving position provides plenty of forward over-car visibility and the large door mirrors make it straightforward to keep track of your surroundings – helped in this instance by a pair of blind spot monitors. These come as part of an optional active safety package that also includes lane keep assist and collision prevention assist to warn you if you're getting too close to the vehicle in front. The afore-mentioned cross-wind assist is fitted as standard, as is electronic stability control. In common with many vans, only one airbag is standard, though up to six are available. 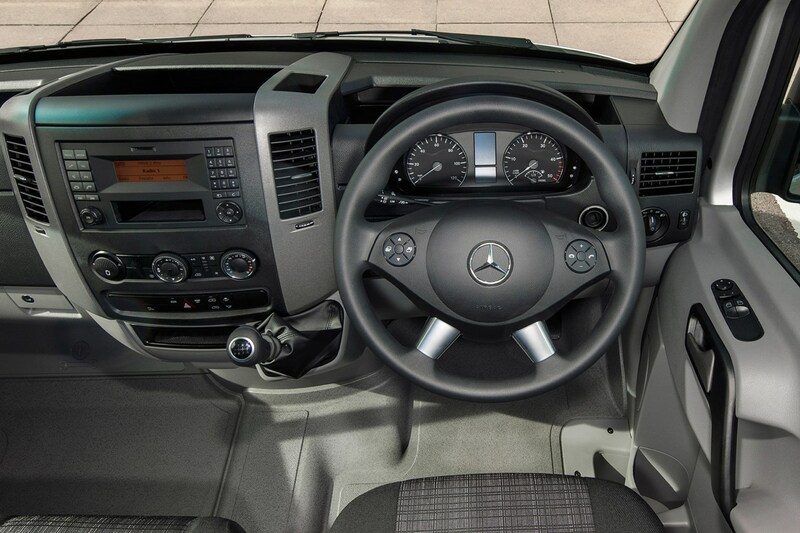 The best thing about driving the Sprinter is how well Mercedes has judged the weight of the steering. It feels substantial and informative without being needlessly heavy. All outgoing Sprinters are rear-wheel-drive, meaning there's no torque-steer here, but with nothing in the cargo area it can spin its tyres at times before the traction control intervenes. Ride comfort is good if a little fussy, but this should settle down when the van is loaded. A seven-speed automatic transmission is also available but is expensive. Official figures rate the 2.1-litre four-cylinder turbodiesel engine at 34.9mpg on the combined cycle. In an urban environment that figure is unlikely to be achievable. However, on inter-city motorway runs (to which the Sprinter is better suited) you won't be too far away from that and, given the performance this seems reasonable. The AdBlue is a consumable you'll also need to keep topped up, though you can expect to see thousands of miles between fill-ups. Mercedes has a good reputation for reliability and its vans are generally sold out of its truck dealerships, which have extended servicing hours to help keep you moving. 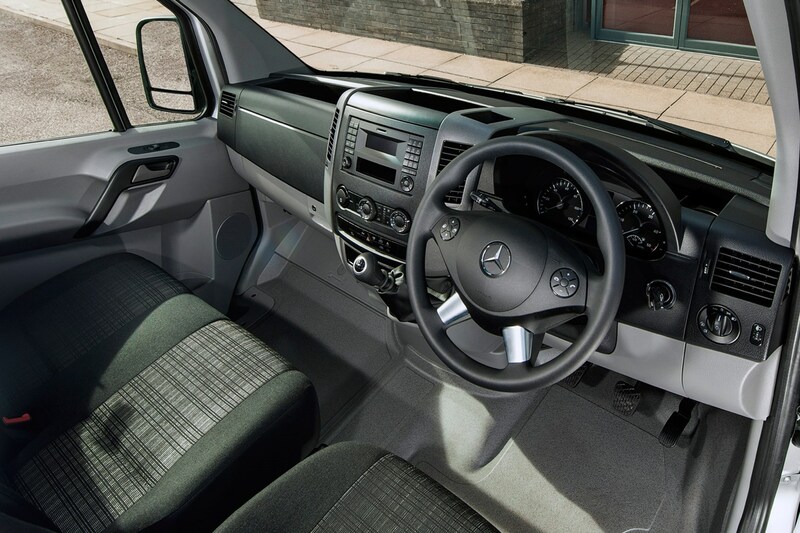 The Sprinter will also go up to 37,500 miles between services – the furthest of any van. Most users will reach the alternative two-year limit far sooner. The Sprinter warranty is up to three years with no mileage limit. Driving over a hundred cars every year as I do – from the functional Nissan Micra to the sublime McLaren 570GT – I enjoy the opportunity to get behind the wheel of a decent van…and the Sprinter failed to disappoint. Okay, it may not offer quite the same degree of value as the Ford Transit and isn't ideal for those transporting the heaviest of loads, but the quality and durability of the product is undeniable. This 314 CDi model strikes a good balance between economy, performance and affordability and represents one of the best buys in the three-pointed star van range. 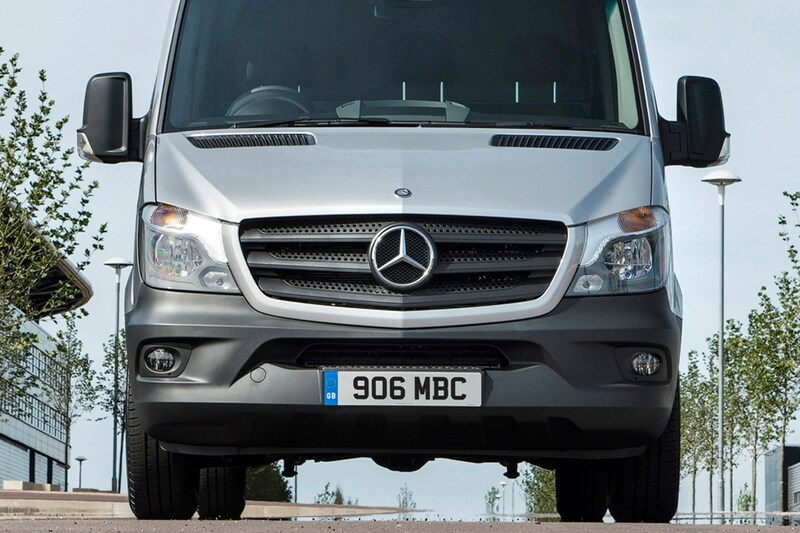 ➤ Check out our special offers on the current Mercedes-Benz Sprinter here, then call our award-winning Customer Service Team on 0800 043 2050. By Wayne Gorrett (@WaynesWorldAuto), Road Test Editor.